Background. We study the problem of mapping proteins between two protein families in the presence of paralogs. This problem occurs as a difficult subproblem in coevolution-based computational approaches for protein-protein interaction prediction. Results. Similar to prior approaches, our method is based on the idea that coevolution implies equal rates of sequence evolution among the interacting proteins, and we provide a first attempt to quantify this notion in a formal statistical manner. We call the units that are central to this quantification scheme the units of coevolution. A unit consists of two mapped protein pairs and its score quantifies the coevolution of the pairs. This quantification allows us to provide a maximum likelihood formulation of the paralog mapping problem and to cast it into a binary quadratic programming formulation. Conclusion. CUPID, our software tool based on a Lagrangian relaxation of this formulation, makes it, for the first time, possible to compute state-of-the-art quality pairings in a few minutes of runtime. In summary, we suggest a novel alternative to the earlier available approaches, which is statistically sound and computationally feasible. El-Kebir, M, Marschall, T, Wohlers, I, Patterson, M.D, Heringa, J, Schönhuth, A, & Klau, G.W. (2013). 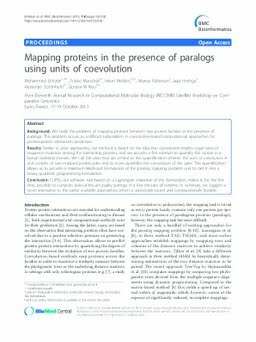 Mapping proteins in the presence of paralogs using units of coevolution. BMC Bioinformatics.